I start off with my notes taken during drills, 7 on 7’s, and then scrimmage. Some thoughts at the end. -Cam Lawrence at practice, hand in cast. -Jameon catches bubble screen. Seeing more of those. After seeing another practice, there are a few things that are beginning to become the norm. Jameon Lewis has had the best spring of anyone in my opinion. I fully expect him to be a playmaker next year. Fred Brown continues to impress every day. He runs really good routes, has really good hands, and is getting a lot of targets. Brandon Holloway is performing better than I expected. He really surprised me at running back. He darts through the line and he appears to be hard for the defense to see. At WR, he uses his speed nicely on routes to get separation. On the defense there is also some guys putting together good springs. 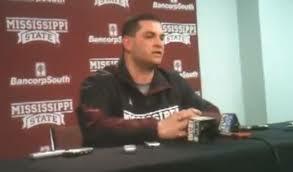 Ryan Brown jumps out at you and has pushed for 1rst team reps. Kaleb Eulls looks much better at DT than DE in my eyes. He can better use his athleticism on the inside. Nick James has had a nice spring and looks to earn plenty of reps this fall. Everyone wants to know how the Brown’s look at LB and while they look good, it appears that they have lit a fire under Bohanna and Hughes. They are both having very good springs and look like they will not allow freshmen to steal their reps. The biggest advantage Bohanna and Hughes have over the Brown’s is physicality. They play angry. The secondary is just another animal all together. This will sound homerish but they all stand out. At CB there is a stuff 4-way competition between Justin Cox, Will Redmond, Jameson Love, and Cedric Jiles. There isn’t much, if any, separation between the 4. In all honesty, I feel comfortable with any combination of the 4. The one thing I can guarantee you is that the starters will deserve it. No winners by default. At S the only incumbent is Nickoe Whitley and he looks much better and fully healed. Then you have Jay Hughes, Dee Arrington, and Deonte Evans battling it out for the other reps. Kendrick Market is right there as well. In all, there is better depth and competition in the secondary than I can remember in my lifetime. -Matt Wells,Richie Brown ,Bednardrick Mckinney, Deonte Skinner, and ChrisHughes looked fast in pass blocking/rushing drills. They’re hard to block. -Tyler Russel making audibles and coverage checks without coaching instructions. -Jameon Lewis getting plenty of targets and receptions in scrimmage (5 straight receptions on passing downs). Looks to be Russell’s go to right now. -can’t comment enough on how much better Nickoe’s conditioning looks. While in attendance of my 2nd practice of the spring I again jotted down notes as practice went along. If you notice more notes on skill players than lineman it’s because of where they practice on the field in relation to where fans have to watch. So far I’d have to say my biggest surprise of the spring is Fred Brown. I honestly wasn’t expecting much but he constantly catches your eye in drills and scrimmage. You can really see him progressing as a WR after coming from a run only offense in high school. I feel good about his future at WR; he will be good for us. The 2 guys that really seem to be asserting themselves as playmakers on offense are Jameon Lewis and Robert Johnson (Rojo). Jameon is going all out of every drill, has great hands, and gets more targets than any other WR. He is really slick when he gets the ball in his hands. I’m really excited about him this fall. Robert is the big, strong presence we have been missing at WR. He’s got really good speed as well and is never brought down by the first DB to tackle him. He’s just too strong for that. On the defensive line it’s easy to notice that PJ Jones has really stepped up. He looks really good physically and is playing like what we expected from him. He’s the leader of the DT group. Nick James looks as if he has really turned it on. He’s my favorite guy to watch because he looks to have the most fun out there. He is definitely the personality of our defense and he looks ready to make a bigger splash this year. Preston Smith has really impressed me at DE. He is gotten bigger and looks really good out there. Since the QB’s are off limits it’s hard to judge his sacks but it looks like our T’s really struggle with him. I think he’ll lead us in sacks again. At DB the number 1 thing that has been evident is how different Nickoe looks. His injury obviously greatly affected his conditioning last year and he looked to be a step slower last year. He is much slimmer this spring and appears to be moving like he used to. It was easiest to notice in the 1 on 1 cover drills how much better he appears to feel. Will Redmond continues to impress and get plenty of opportunities with the 1’s. The battle at SS is pretty cool to watch. Just from eye test and the drills you want to hand it to Dee Arrington. He’s impressive looking physically and athletically. Then in scrimmages and 7 on 7’s, Jay Hughes is always in the right spot (had 2 int’s close together today). I’m not sure who will ultimately win that battle but I’m comfortable with either. The last thing that really jumped out at me was during our pass blocking/pass rushing drills how good our LB’s were. They were matched up with RB’s and TE’s and our LB’s were simply unblockable. Mckinney is so long, he is physically suited to be a good blitzer. The number 1 guy that stuck out was easily Matt Wells. He is lightening and no one came close to putting a body on him. 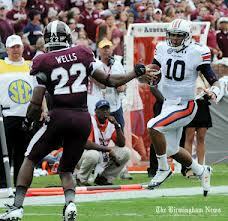 With Collins saying he’s bringing the mayhem, I really expect Matt Wells to be utilized much more to his ability. If he gets turned loose blitzing this fall, I really think he will make the biggest improvement from last year. The correct utilization of Matt Wells and his elite athletic ability will pay dividends. After I attended MSU spring practice on Friday, I posted my notes I jotted as I watched. As promised today a few more in depth thoughts. Sorry about the holdup but I had a busy Easter weekend with traveling and family and I hope everyone enjoyed theirs as well. -Quarterback- The main thing that sticks out here is that Tyler is taking a lot of reps in drills under center. Many fans have been calling for it since it seems to suit his skill set and I think we’ll see it. -Running Back- Ladarius Perkins still looks like he is the most complete guy. No doubt about him starting again. The competition between Derrick Milton and Josh Robinson for the 2nd spot is intense (Griffin being held out for ACL rehab) and it is being manifested in both guys going extremely hard on every drill. Milton looks like our best back for receiving out of the backfield and Robinson looks like a tough between the tackles runner. These 2 are in an almost dead heat. -Wide Receiver- Rojo and Joe Morrow look to be the starters. Michael Carr looks really good for taking a year off and has the best hands in the group. Fred Brown is the surprise of this group to me. He looks really smooth out there and has a knack for getting open. At this point Jeremy Chappelle is our 5th best outside receiver. He looks kind of lost but that is to be expected. He should get a lot better by the fall but I doubt he can overtake Rojo, Morrow, or Carr. Jameon looks to be in the best shape he has ever been in and his hands are like glue. Jameon definitely looks to be cashing in on his opportunity. Brandon Holloway was a bit of a surprise too. He ran good routes and was really quick. He had 1 really nice double move to the corner for a TD. -O line- With everyone basically returning I believed this could be a strength of the team and I think I was right. In my mind our O line is in better shape than it has been the last 2 years. Our starting 5 looks really good and there are some depth guys who look to be really improving especially Devon Desper, Dylan Holley, and Justin Senior. -Tight Ends- MSU is set at TE for the next few years. Malcolm Johnson looked really good and is poised for a breakout year. Brandon Hill is bigger and more physical and has really good hands. I look for him to be a goal line threat. Rufus Warren is a massive guy that moves surprisingly well with good hands. Gus Walley looks to have gained some weight too. Mid semester Hargrave transfer Artimas Samuel was pretty surprising. First off is his size. His arms are bigger than my head and his hands may be the best of the position group. At 260 he is a bit overweight and it is affecting his speed but I fully expect Balis to get him at an optimal playing weight that I would estimate in the 235-240 range. -D Line- The high end talent here is the best it’s been since the Joe Lee Dunn lines of the late 90’s. Nick and Quay both seem really excited and are giving a lot of effort out there. Hopefully they realize that they could be huge players for us and are taking advantage of their opportunity. PJ Jones looks really good too and it’s easy to forget he was a 4 star in his own right. David Turner doesn’t play to 2 DT positions differently like Wilson did and I saw some cool combinations. James and Viges looked like a huge, tough DT’s while Quay and PJ looked like a speed duo. At DE I mostly watched the younger guys. Ryan Brown and Torrey Dale are really tall guys. Brown will see a lot of reps this year and looks to be a future starter. AJ Jefferson also looks to have grown some. He looked taller to me. -Linebacker- Our starting 3 of Mckinney, Skinner, and Wells all look improved. Mckinney looks to have picked up some weight and is starting to look like the NFL prospect that he is. Hughes and Bohanna are both doing everything they can to challenge for reps. Beni and Richie Brown are getting most of the 2nd team reps and it’s easy to see why they have so much hype. They are both really smooth players with a lot of speed. I don’t think they challenge for starter reps this year but our future is in good hands here. -Defensive Backs- I’ll start this off with the fact that Justin Cox is everything that has been advertised. Dude is a legit lock down SEC corner. He plays very physical and mean out there and as he learns the system he’ll get better. He will help bridge the loss of Banks and Slay. The other surprising corner was Will Redmond. He was running with the starters and sure looks like that’s his spot to lose. If those 2 starters stick we still get a very good player in Jameson Love when we go 3 CB sets. I felt a ton better about CB after seeing those guys. At safety Nickoe looks to be in much better shape. He is much slimmer and appeared to be moving better. Dee Arrington was running as the starter at SS and that makes for a talented starting 4. I still expect Jay Hughes to challenge for a starting spot and he looked good in practice as well. -Geoff Collins really seemed to coach the whole defense and not just his position group like Wilson. He is very hands on. There was 1 part of practice that stood out when he had the whole defense in a goal line set and he was having WR’s motion across the formation. He reviewed what this motion meant in multiple different defensive setups. Every time he was doing the same things. He was asking Mckinney, Skinner, Redmond, Cox, and Arrington who covers him? Do we follow him across the formation? How do we align? Collins was doing this even while the D line was standing where they would be lined up. It’s clear that he doesn’t want just the guy with the assignment to know but the whole defense to know what is going on and why they are making the adjustments. -Our WR core looks completely different. The last few years we looked really small. Rojo is 224, Morrow is 210, Carr is 220, and Malcolm Johnson is 220. When these guys are all lined up we look huge out there. Our guys have gone from small to looking like a stable of running backs. I’m very excited about this group’s athleticism and physicality. -There were some high profile recruits at practice in CJ Hampton and Domique Booth. Although CJ Hampton is committed to Ole Miss he has given multiple interviews after the commitment that he is still open to the recruiting process and that it’s not over. His attendance in Starkville on Friday cemented those quotes in my mind and I think we have a good shot at flipping him. 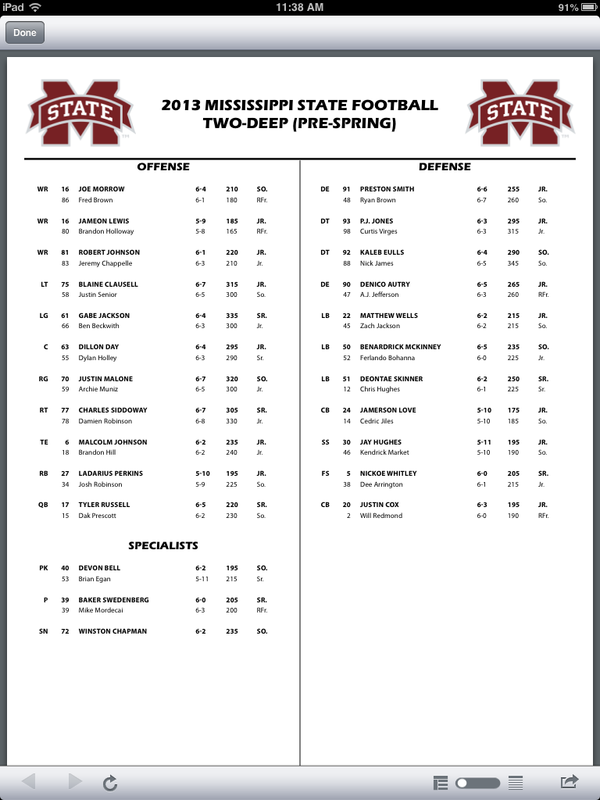 Yesterday MSU released its Pre-Spring 2 deep depth chart and many eyebrows were raised across the state as fans immediately started breaking it down. Before I go any further, Dan Mullen was quoted as saying something along the lines of this depth chart not meaning anything. While that is correct, I still believe that it gives us a good idea of who we will see get reps next year and also who had a good offseason and gave themselves a shot at getting on the field more. -Justin Senior (soph) appeared on the depth chart as the 2nd team LT. I have been wondering who was going to claim that spot because many have been given a chance at T. Good to see a clear backup for Blaine Clausell. -Josh Robinson (soph) has the 2nd spot at RB. He is also listed at 5’9 225, which means he has gotten bigger. 2nd RB will be hotly contested this spring and even more so in the fall when Nick Griffin returns. Do not count out Derrick Milton. 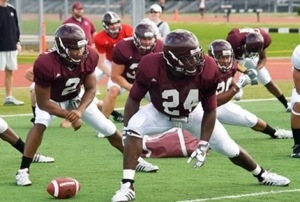 -Jeremy Chappelle (jr) starts of pre spring as a 2nd team WR backing up Robert Johnson. Many believe he has a chance to unseat Joe Morrow as the 2nd starter. We will have to see. -Fred Brown (rFr) started as a 2nd team WR. That might not mean much to many but it is a shock to me. He came from a running offense in high school and had a lot to learn. I’m shocked sr Ricco Sanders is not backing up Morrow. -Winston Chapman (soph) is our starting snapper right now. The reason I include him is because I’ve never heard of him and that’s a more important spot then a lot of fans realize. It’s only a big deal when he sails one over the punters head. -Ryan Brown (soph) and AJ Jefferson (rFr) grabbed the backup DE spots. Brown saw action last year but Jefferson getting the other speaks to the offseason he had. Torrey Dale (rFr) is a guy a lot of fans are excited about but he couldn’t crack the initial top 2. Competition will be intense here, especially with Chris Jones on the way. -Justin Cox (jr) getting a starting spot at CB from the get-go is somewhat a surprise. I thought he’d end up with it but start off with the 2’s. -Kaleb Eulls (jr) got the starting nod at DT. I have to preface what I’m about to say with the fact that he is a great kid and great ambassador for MSU. In 26 career games as the starting DE he had 1 sack and 4 TFL. If he’s going to start at DT his production needs to spike dramatically. Great kid by all accounts but his numbers at DE will not cut it in the SEC. -No Quay Evans (soph) in the 2 deep has many fans scratching their heads. Arguably our most talented DT and not in the early rotation. If he works hard this spring I can see that changing. I think it’s on him. He’s a potential future early NFL draft pick so he should be motivated to go all out. -No Richie or Beni Brown (both rFr) is the LB 2 deep. It’s not a shock to me when you see how veteran the group is. Our top 5 guys have gotten extensive game reps and Zach Jackson has been in the program a year before them. I wouldn’t worry. They’ll probably play all special teams and push hard for reps.
MSU announces that the spring practices are open to the public again this year. For all of the football related things that Dan Mullen closes to the public, I love that he gives the public a look in the spring. I went to 6 practices last year and it really gives you an inside look at the players progression, the coaches and their styles, and how the players and coaches communicate on the field. There are so many things to watch this year many are glad the spring remains open. The position battles should be intense. There are 2 juco transfers (Jeremy Chappelle and Justin Cox) that are being counted on to compete immediately. We get to see how David Turner differs from Chris Wilson and the way the defensive linemen react to him. Billy Gonzalez takes over the WR position and the group lost 5 seniors leaving competition wide open. I could go on but you get the point; there is no shortage of story lines. These practices are open for a reason. It’s 100% for the fans. I encourage everyone to take advantage of this privilege and go support the players and coaches. STARKVILLE, Miss. 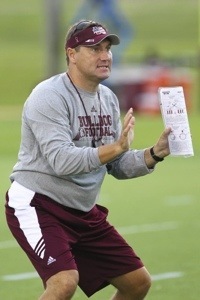 – Head football coach Dan Mullen and his charges will begin on-field preparation for the 2013 football season as spring practice begins on Thursday, March 21. The 15 practice sessions, which are all open to the public, will conclude with the annual Maroon-White Spring Game on April 20 as part of Super Bulldog Weekend. The Bulldogs begin the 2013 campaign in the Texas Kickoff Classic on Aug. 31 against Oklahoma State. **All times tentative, and dates may be changed due to weather. Follow @MStateFB on Twitter for the most up-to-date information. Thursday, March 21 – 4:30 p.m.
Tuesday, March 26 – 4 p.m.
Thursday, March 28 – 4 p.m.
Friday, March 29 – 4 p.m.
Tuesday, April 2 – 4 p.m.
Thursday, April 4 – 4 p.m.
Tuesday, April 9 – 4 p.m.
Thursday, April 11 – 4 p.m.
Friday, April 12 – Scrimmage at Davis Wade Stadium – 3 p.m.
Tuesday, April 16 – 4 p.m.
Thursday, April 18 – 4 p.m.
Friday, April 19 – 3 p.m.
Saturday, April 20 – Maroon/White Spring Game – Davis Wade Stadium – 1 p.m.